Dictations are a very difficult activity to get right. Traditional computer based dictations are usually a quite awkward, unhelpful and ultimately frustrating experience to say the least. The idea of this learning application is for it to be more of an enjoyable exploratory, learning activity than a listening test. So far it has been my most popular activity among learner test groups. Learners first listen to the entire audio recording. 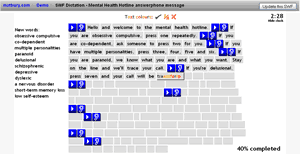 The recording in reality is a collection of recordings of individual sentences that the Flash learning application plays in sequence. The learning application is dynamic, which means it automatically loads all the text and audio that it needs and creates the learning interaction. No programming is necessary. If you change the text and audio, or if you want to display it in a larger or smaller area, the learning application adjusts automatically. Learners listen to the entire recording once as a preamble. Then he/she can listen to each sentence of the recording individually by clicking on the blue play buttons at the start of each sentence and type in the words. Next to the play buttons are “time-stretched” buttons. These play alternative recordings which have been time-stretched. Time-stretching is a sophisticated process by which a sound is lengthened or slowed down without altering the pitch. It makes rapid speech slower and therefore easier to understand. It’s a natural way for learners to get used to hearing and understanding connected speech. As learners type, the letters are immediately colour coded red, amber and green, giving intuitive feedback and encouragement to keep trying. As words are successfully completed, they are ‘locked down’ so that the learner is unable to accidentally change the completed words to incorrect ones. You can try out the Flash interactive dictation activity by logging in to my Learning Management System . Select “Login as a guest”. Please feel free to post a comment or ask a question below.